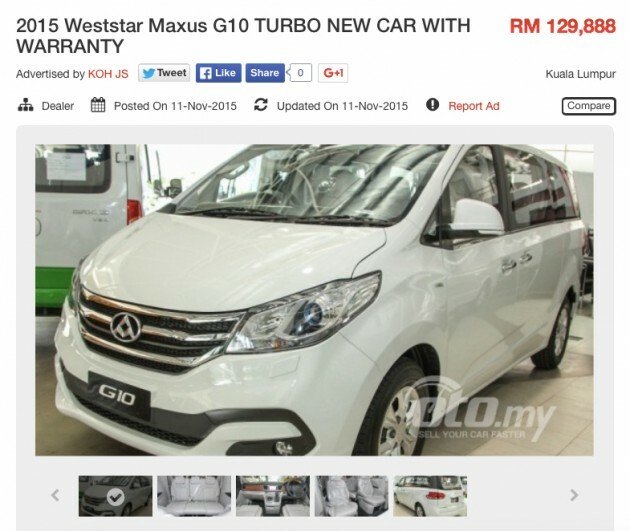 An ad for the Maxus G10 has appeared on our sister site oto.my, with a sticker price of RM129,888, ten grand more than the originally mooted figure. According to the ad, the big MPV brought in by Weststar is limited to just 200 units in Malaysia. But what on earth is a Maxus G10? Back in June, we showed you the G10, which compares in size to the Hyundai Grand Starex Royale in the Malaysian context. Introduced in China last year, the G10 seats up to 11 although the car we shot had a 10-seat configuration. Weststar says that one of the selling points of the G10 will be the fact that you can specify how many seats you want, with a minimum configuration of five seats. The big box measures 5,168 mm long, 1,980 mm wide and 1,928 mm tall, and has a 3,210 mm-long wheelbase. The G10 is powered by a 2.0 litre turbocharged GDI petrol engine with 225 hp and 345 Nm for output numbers. Mated to a six-speed ZF automatic transmission with manual mode, the “TGI” mill is able to push the brick all the way up to a 190 km/h top whack. Standard kit includes dual-zone auto climate control, rear air con, passive entry/keyless ignition, cruise control, HID xenon headlights, LED tail lamps, a moonroof and a DVD player with a seven-inch display as well as a six-speaker audio system. The people mover also comes with leather seats, parking sensors, front/rear fog lamps and a reverse camera. It rolls on 16-inch alloys and 215/65 tyres. The decently-specced MPV counts two airbags, ABS with EBD, brake assist and ESP as safety kit. The ad mentions a two-year warranty. Looks like good value on-paper next to the 2.5 litre turbodiesel-powered Starex, which is priced from just below RM160k, although the Maxus is an unknown proposition. I hope that you can come up with suggestions or car reviews for cars that are elder/senior citizen friendly that we can buy for our mother/father. depends on the situation of the senior citizen. most senior citizen are healthy, dont need help to get into car. but if you are pointing at senior citizen who is weak, having illness, regardless lo-ride or hi-ride vehicle also need assistance. this car is good for my four wives and our 10 kids. Just nice. Eventhough I kerja kerani but still I have to support 10 kids, so, I need a big carrier like this. An SUV like the HRV or Subaru XV is suitable. Getting in and out is easy. I think this is a great idea for a Driven episode. It’s not only cars with the specialised seating, but for some, just normal cars with seats that have a reasonable hip point would be good enough. This is because car importers/distributors have to get their selling price approved by the Gomen. They can’t price it low even if they want to. it is pretty obvious why. We signed a Free Trade Agreement with China. The result is an invasion of Made in China products, especially automobiles, into Malaysia. Businesses will buy vehicles if the ownership and running costs make sense. With this, service centre network would be a big issue. The Hyundai Starex isn’t going to be challenged lah. This is the real deal, the real bungalow on wheels….unlike the poser overpriced crampy alphard. Obviously you never sit in Alphard before. Don’t make sot hai comment if you don’t know much. Work hard so you cam afford a sushi. Alphard is not that great la…. How about the engine? While I have to give them credit for using turbo charged direct injection (better FC & more power), I would rather they use a multi point injection engine. A lot more components can fail with a ‘TGI’ engine (turbo, high pressure pump, injectors). I am not sure Weststar has the capability to maintain such an engine. Buy this for keep. Don’t mention RV and breakdown in Perlis. Maintenance cheap as normal Japanese sedan? Hands down better than Hyundai Starex with 3 point seat belt. Hyundai UK models comes with 3 point seat belts. Hyundai CEO thinks Malaysian are ‘stupid-er’ maybe?